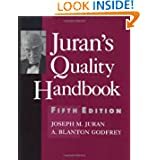 For decades, Juran's Quality Handbook has been the one essential reference in quality management and engineering—the ultimate authoritative source of answers on quality applications, procedures, techniques, and strategies. Now this Fifth Edition—a major revision and the first new edition of Juran's Quality Handbook in more than 10 years—forges a new standard in tools for quality. Bringing managers and engineers the most up-to-date methods, research, and theory, under the guidance of a team of the world's top experts, Juran's shows you how to plan for quality, achieve quality control, and ensure quality results. Packed with new methods, research, and thought on quality, and emphasizing the need for quality software and quality software development methods, this completely updated classic also gives you new information, new techniques, and new applications. Broad in scope and inclusive in methodology, Juran's Quality Handbook is the reference of choice for anyone concerned with quality in business, manufacturing, or engineering. Whether you're just beginning your journey or a longtime traveler on the quality path, this book is the best possible companion for your voyage.